If you are looking for Learn to sail courses, our popular Combo Package is a great solution. The package gives users full RYA level 1/2 Training, PLUS Reduced Price Membership PLUS Boat Hire. 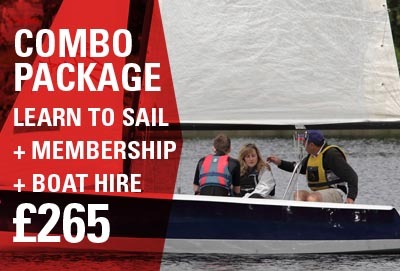 The big benefit of a combo package combining your RYA training with a full membership means you get the benefit of continued support in your sailing with flexible membership and use of fully equipped club boats. Combined packages start at £265 (offering a saving of £100 if bought as separate). The Price for a Combo package varies depending on the type of membership you require and the time of year that you join. Student – aged between 18-21yr in full time education. Why Choose a Combo Package? Learning to sail is fun and challenging, however, attaining RYA level 1 or 2 can be just the start of your sailing journey. Attaining RYA level 2 can require extra practice, plus one you have reached this level we’re sure that you’d want to improve your skills further and become a competent sailor. The combo package gives you all the support you need. Training will take place during one of the designated Club Training Periods. The first period is to run between May and June 2018 with exact dates and times to be confirmed (subject to demand). What does the boat usage include? You have access to the club’s boats as part of the deal (subject to availability). We have a selection of single & double hander boats for you to use. The benefit is that not only do you have a boat to sail, but you can try different styles and see which suits you best. Ultimately you may want to buy a boat (which can be daunting). By using the club boats you can see what suits you best and get a real feel for the types available. View some of the most popular pages.